How To Create A Gift Deed Online? A gift deed is a legal document that records and details transfer of movable or immovable property from the donor (giver) to the donee (receiver) without any exchange of money. The “gift” must be a well defined movable or immovable property and be transferable. 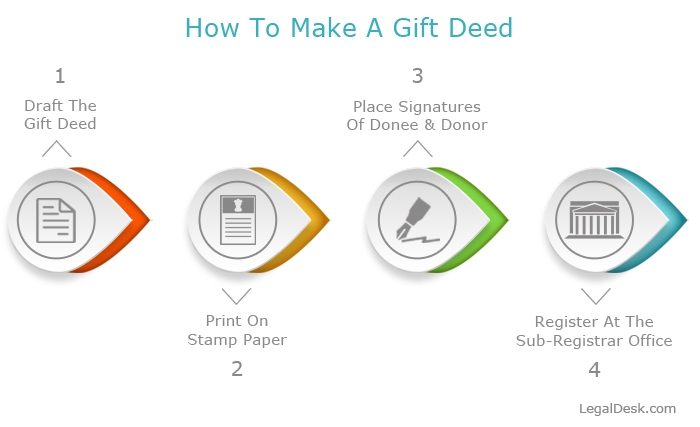 How To Make A Gift Deed? The deed should be based on the consideration of natural love and affection of the Donor to the Donee. Since there is no monetary dealing involved, there is no tax liability on both the parties (tax exempt). Remember, the donor in the gift deed must be solvent and should not use this arrangement for illegal gains or tax evasion. Transfer of property, specially an immovable one, needs to be documented in accordance with the Transfer of Property Act, 1882 in India and must fulfill the conditions laid out. Registration of the gift deed for an immovable property is mandatory and must be done with the Sub-Registrar in the area where the property is situated. When To Make A Gift Deed? At the time of transferring the rights of property as a gift. When there is no exchange of money involved. To provide a legal representation to the gift being transferred. What Should Be Included In The Gift Deed? Relationship details of the donor with the donee. Rights & power and authority of the Donor. Description and details of the property to be gifted. Confirmation clause on delivery of possession. This gift deed format is simple, yet all inclusive. If you are staring at gifting property to a dear one and looking for that perfect document, use our intuitive format and be ready to print the gift deed in minutes! Firstly, get the property (to be gifted) valuated by an approved valuation expert. Secondly, assess the stamp duty and other misc charges (The value of stamp duty varies from state to state). Print the gift deed, get signature of two witnesses. Keep handy title deeds of the property, encumbrance certificate, statement of particulars of the property at the time of registration. 1. I would like to gift a site to my minor son? Can I execute a gift deed and make him the donee? A natural guardian can accept the gift on behalf of a minor and administer it until the minor attains majority. A minor is not competent to contract and hence, cannot be the accepting donee or signatory to the deed. 2. Is the gift deed for an immovable property taxable? Transfer of property rights to immediate relatives that includes spouse, children & parents in the form of gift deed is not taxable. 3. I am planning to purchase an apartment (under construction). Can I execute a gift deed and transfer ownership rights to my daughter? As you mentioned the flat is under construction, you will not be able to execute a gift deed in your daughter’s name unless the property is legally registered in your name. The gift must be on an existing property and not a future one. 4. Is the acceptance of the donee mandatory for Gift deed? Acceptance to the gift deed by the donee is mandatory. A gift deed will be considered invalid if the donee is not willing to accept the gift. Signature of the donee is a must to make the gift deed compelling on both the parties. The donee must accept the gift within the lifetime of the donor. 5. Can a registered gift deed be cancelled? A registered gift deed cannot be cancelled or revoked. However, one can seek legal remedy if the deed was executed by coercion or undue influence on either of the parties. This process can be painful and cumbersome as this will be contested in a competent court. An unregistered gift deed can be revoked as it holds no validity.